I’m the author of the two Raven trilogies: Chronicles of The Raven and Legends of The Raven, and the epic fantasy duology, The Ascendants of Estorea. 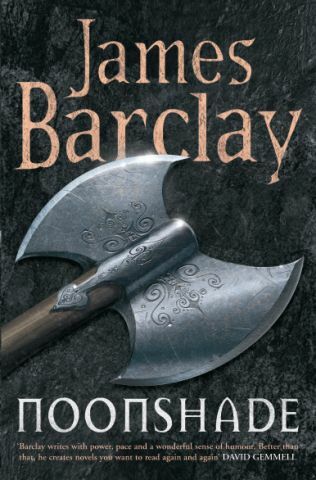 Ravensoul, was the final installment in the Raven saga. The Elves trilogy was completed in 2013 and I’ve written two novellas, Light Stealer and Vault of Deeds. The first in my new Blood & Fire series, Heart of Granite, was published in 2016. I emerged with the traditional kicking and screaming on 15th March 1965, shortly after midday. I lived in Felixstowe, Suffolk for eighteen years in the same house with the same set of parents, two sisters and a brother. We lost our wonderful Dad in January 2013 and though we miss him terribly, we know he lived a wonderful life and we owe him so very much. I am, and will always be, an Ipswich Town FC supporter. Writing came from a love of reading. I was introduced by brother Mike to Sci-Fi and Fantasy after reading every Biggles book there is, before I was 10. Creativity developed through consuming books and through long years of role playing games in both genres (plus a fantastically entertaining wild west game called Boot Hill) and I’ve been scribbling since the age of eleven – it’s my favourite hobby. I will forever feel honoured and lucky to be paid for indulging in it. Early avid reads included Tolkien, Aldiss, Heinlein, Alan Dean Foster and Moorcock. There were many more. First of any length at age 13. It was and is utterly awful. For the record, the story is called “Troja: Dawn”. I’ve still got it. Second came a vaguely sci-fi/fantasy fusion. Its very pompous title is “What Price, Civilisation?” It was an improvement on the first (not difficult), written when I was 15 and the body count is far lower. I’ve still got it. By the end of my course, I’d decided to become an actor so I ambled off to London to do a post graduate course in Performing Arts. By the end of that, I’d made lifelong friends but had also grown cynical about the business. Still, I joined forces with one of those friends and earned my Equity Card (mainly because the Principal at the drama school said I’d never get it). Not a lot came of the first foray but the desire never leaves you and I decided to try again at the tender age of 48. It’s been fun. 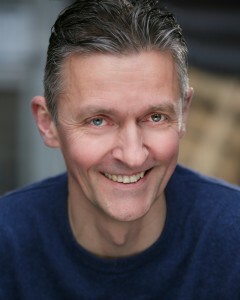 I’ve appeared in several independent films, one award-winning TV comedy pilot and in theatre have been lucky enough to land roles in amazing plays like ‘Jeffrey Bernard Is Unwell’ (in which I played the title role) ‘The Ladykillers’ and ‘The Importance of Being Earnest’. I don’t suppose I shall ever give it up. This was the first full length one and had its roots in the earlier sci-fi/fantasy fusion. I drafted it three times, I think and submitted it around the place. It’s called The All-God’s Gift. I’ve still got it. Maybe I’ll look at it again some day though to be fair it’s pretty awful too. They started at 23. First and worst job was as a parcel delivery driver. I lasted nine weeks. Next have come three financial/investment jobs, ending up as Advertising Manager for Insight Investment, the job I left in March 2004 to write full time. I never stopped writing and submitting and in May 1998 the call came through: I was going to be published. I was at the office and it was a surreal moment, one of those you never forget. The next best feeling is seeing your book on a shelf for the first time – absolutely incredible. Lump in the throat stuff. That was Dawnthief, first book of six, now seven, about The Raven. Since then, Noonshade, Nightchild, Elfsorrow, Shadowheart and Demonstorm were written on and off the London Underground. After finally managing to give up the office life in March 2004, I have written the epic fantasy duology The Ascendants of Estorea and two novellas, Light Stealer and Vault of Deeds. This latter is my first foray into comedy, by the way, and it was an absolute blast. Check out the bibliography page for more. The very last Raven novel was Ravensoul and it was the book that made my editor cry…and me while I was writing it. My latest trilogy, concerning the Elves of The Raven’s world, is now complete: Elves: Once Walked With Gods, Rise Of The TaiGethen & Beyond The Mists Of Katura are all on the shelves. I’m delighted with how they’ve turned out. Most recently, I forayed in to sci-fi with the blockbusting adventure that is Heart of Granite. Writing that book was an utter joy. I am extremely happily married to Clare (thirteen years now) and we live in south west London. Our world was made wonderful by the arrival of Oscar James on 25th January 2007. Joy is the word to describe being a dad. That and exhaustion… And, since we felt that exhaustion was a GOOD THING, we thought a second child was a great idea. Actually, it was a great idea. Oliver Dylan was born on 8th June 2011 and he has made us complete. A force of nature and a fabulous brother for Oscar. 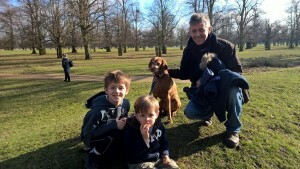 We’ve got two dogs as well… Mollie & Loal, both Hungarian Vizslas. I’m not, or I didn’t think I was, a dog person and I had to be convinced to go for it but I wouldn’t be without them (yes, yes I know they won’t live forever but you know what I mean). I’m currently working on a Young Adult series, a speculative thriller and the sequel to Heart of Granite. It’s busy but in an extremely good way. And when work is done, I get to muck about with my sons and watch them growing up. That’s special, is that.